ISL 2018, Chennaiyin vs FC Goa Highlights: FC Goa handed defending champions Chennaiyin FC a 3-1 defeat in an Indian Super League (ISL) match at the Jawaharlal Nehru Stadium here Saturday. The attacking Goa side capitalised on the home team’s defensive lapses to score one goal in the first half and added two more in the second to earn full points after drawing its opener against NorthEast United FC. The visitors broke through in the 12th after the early exchanges with Edu Bedia finding the back of the net. He latched on to a ball played in from the right and slotted it past the CFC goal Karamjit Singh as the defence made a mess of things. Chennaiyin now have a goal difference of -3 and they have only played two matches so far. Not a great start to the season for the defending champions. A consolation. Straightforward. Corner floated and Eli Sabia has to only turn it into goal with minimal resistance. Chennaiyin can end this match with a better goal difference now. There will be SIX minutes of added time. But that is not as much as what is there for the Premier League match between Burnley and Bournemouth that just got concluded - eight minutes. Jahouh plays in Mandar who is absolutely free.....but is also offside. Jahouh showed today why he is the best midfielder in the league. His passes have torn the Chennaiyin defence apart. Thapa passes the ball forward straight through the heart of the Goa defence trying to find Carlos Salom. The ball rolls to the keeper who collects it easily. Bread and butter stuff for him. A lovely curling long ball from Jahouh into the box and Fall gets the back of his head to it. It loops over Karanjit Singh into goal. Chennaiyin have themselves to blame here. FC Goa have not been that great in attack but Chennaiyin have been absolutely sloppy in defence. Gregory Nelson cuts in from the right and takes a bang at it. The ball has certainly landed in the Cooum river and is making its way to the Bay of Bengal by now. Seriton Fernandes smashes into Gregory Nelson who was speeding down the right flank. He gets a yellow card for that. Seriton Fernandes squares it into the box, Coro gets to the ball and an easy finish in the end. Sloppy defending from Chennaiyin FC and they are being picked apart at their own home. A half that has mostly been about shouting and screaming, between players themselves and players and referees. Not exactly the greatest showcase of football this. If there is anyone who is watching this sport for the first time today, please don't judge it on the basis of this match. Goa players are now screaming at the referee to give a yellow card to a player who has gone down in the box. No yellow card to him for diving but the referee doesn't give a penalty either. At leat five minutes of the last 10 have gone in players remonstrating with the referee. Raphael Augusto makes the most of a foul by Ahmed Jahouh. The Moroccan gets a yellow card and he gets in the referee's face for that. That's three yellow cards in the last five minutes and we are not even past the half-hour mark. Mailson Alves and Hugo Boumas exchange niceties and they both get a yellow card each for their efforts. Replays show that Mailson may have got a headbutt in. He is lucky to have got just a yellow then. FC Goa have more possession and Chennaiyin are pressing high. The problem with doing that is that they are getting caught out every time Goa attack. Fortunately for them, Goa simply can't make a clean pass in the final third. Edu Bedia connects perfectly and manages to score inside a crowded box. We have seen a number of strikers taking a wild kick and completely messing up shots like these. But there are no mistakes here - not from the attacker at least. Because the ball came to Edu Bedia after one of the Chennaiyin defenders took a wild kick to clear it and missed the ball completely. Astonishing stuff. The ball floated up field and Goa's Coro seems to be completely offside. But the linesman's flag stays down! Thankfully for Chennai, Coro can't control it and Mailson Alves kicks it out of play. He then berates the linesman. No replays so we can't decipher if Coro was offside or not. Raphael Augusto gets us going for the evening, the pitch in Chennai has certainly seen better days. Let's hope no one gets injured because of this. Lots of empty seats in the stadium too. Here's how @ChennaiyinFC and @FCGoaOfficial will line-up for #CHEGOA. Which side do you think will bag the 3⃣ points tonight? We have two teams today who have a lot of history together. Said history isn't exactly a nice one either. Unruly incidents are common in the ISL but they are yet to be seen this season. Chennaiyin will hope that their first match at home will result in their first points while FC Goa will be trying to do better than concede in the 89th minute of the match, like they did in Guwahati last week. ISL 2018, Chennaiyin vs FC Goa Highlights: Chennaiyin FC will be aiming to make a course correction after their opening round loss to Bengaluru FC when they take on FC Goa in an Indian Super League encounter Saturday. 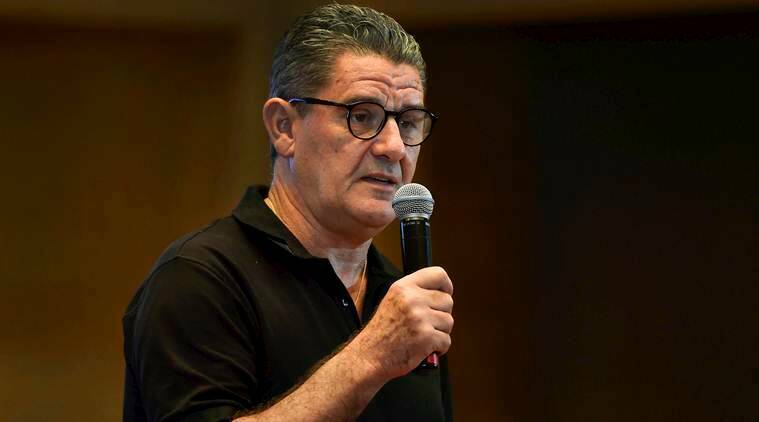 John Gregory's men created a few chances but were largely disappointing their 0-1 loss to Bengaluru and the coach would expect his strikers to up the ante against the Gaurs. Due to heavy rainfall during the past two days, conditions at the Nehru stadium can be expected to be sluggish, making the job a tad tougher for the forward-line.